Akron, Ohio is quickly becoming a favorite destination for Casual Runners. You can check out our other great coverage of events put on by the Akron Marathon: including the 2015 Thirsty Dog 8k, the 2014 Akron Half Marathon, the 2013 Akron Half Marathon, and Mike’s not-so-successful first race experience at the 2012 Akron Marathon Relay. The Goodyear Half Marathon & 10K is the second leg in the inaugural Rubber City Race Series. The first, the Thirsty Dog 8K and 1 Mile, was held June 27, 2015. The last leg of the series, the Akron Marathon, Half Marathon, & Team Relay, will be on September 26, 2015. In order to stay in the running for the unique challenge medal that they give out for completing the series, I had/wanted to run this second leg. As a summer race, there is plenty of time for entrants to train up to the event. The race organizers have done a good job of designing the options for the three legs (1 mile/8K in late June, 10K/Half Marathon in August, and Half/Full Marathon in September) in a way that a participant can use the prior legs to train up for the later legs. Going from 8K (just under 5 miles) to 13.1 miles in approximately seven weeks is just about the perfect amount of time to train from the long option for Thirsty Dog to the long option for Goodyear—especially if you were able to run more than 8K by end of June. This math works out for the shorter options too (1 mile to 10K/6.2 miles in 7 weeks is very doable too). 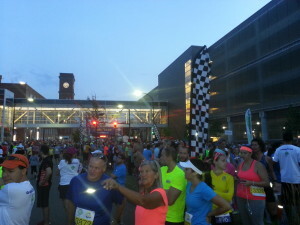 I commend the Rubber City Race Series for making the build up to each leg work. As for my own getting to the race, on paper I should have been completely ready to run, because I had run two half marathons earlier in the spring (the Canton Pro Football Hall of Fame Half Marathon and the Medina Half Marathon, and had the great weather of summer to maintain my shape for the race. Theory and practice are two different things, however. I’ll have more on this in a future article, so stay tuned. The race was scheduled to start at 6:30 a.m., so I did the usual early wake-up-at-the-crack-of-dawn routine. I got an extra 30 minutes of sleep (to 4:30 a.m. this time!) and made it to the starting area with plenty of time…Well, there was little bit of a traffic jam getting off of the expressway and into the parking area (which was plentiful at Goodyear’s World Headquarters), but fortunately the organizers pushed the start back by 15 minutes to allow everyone a chance to get settled and loaded into the starting chute. The forecasted rain and thunder never came, so runners were treated to a typical summer day. Easy enough to dress for: I wore my Team Casual Runner tech shirt, tech shorts, and my trusty Zuma running sunglasses. The race Expo was more of a bib pickup than a true expo (Akron appears to be saving its expo juice for the main race weekend in the fall). It was held at a local hotel and could not have been quicker or easier. The volunteers were plentiful and knowledgeable, and loaded us down with our bibs, gear check bags, and swag(!) before sending us on our way. 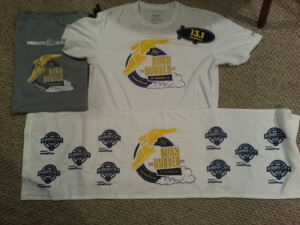 As with the Thirsty Dog 8k, the Goodyear Half Marathon and 10K had a blend of common and distinct swag. Participants in both races received an ASICS short sleeve tech shirt, an event logo drawstring bag, and food and beer tickets to the post-race foot festival. Additionally, the half marathon finishers received a nice hand towel with the race logo. As a bonus, my favorite item!, a “13.1” magnet in the shape of the Goodyear blimp. The start and finish of both races was located on the campus of Goodyear’s World Headquarters, so runners were able to avail themselves of a free parking deck (another nice touch) with plenty of spots to accommodate the field. Because there had been a little traffic congestion getting off of the highway, the race start had been wisely delayed by fifteen minutes to allow people additional time to make it to the starting line. Race Icon. While waiting for the gun to go off, people had the first of many chances to see the Goodyear blimp circling overhead. Again, my one minor quibble concerns the race start. The chute was wide enough this time, so the crowding was not as bad as it had been for the Thirsty Dog. But, the left side of the pack came to a stop almost as soon as it had started. This was due to the runners having to avoid a “pace car” parked on the course not ten yards after the starting line. I have to think this was an oversight, and I appreciate the race’s dedication to a “racecar” theme, but this did have the unfortunate effect of creating a bottleneck right as people were ramping up for their races. The half marathon and 10k events shared the same mass start and continued on together for the first 3.5 miles or so, where the 10k broke off to return to the finish and the half marathon began what were a challenging series of gradual hill climbs. In contrast to the Thirsty Dog (which ran through downtown and the University of Akron campus), the Goodyear Half Marathon and 10K was primarily run through the neighborhoods surrounding Goodyear headquarters. We went past the old Air Dock (and Akron landmark), Akron Fulton airport, and Derby Downs, home to the Soap Box Derby. As a consequence, there was slightly less course support when compared to the Thirsty Dog (and, given our past reviews on Casual Runner, I predict the Akron Half and Full Marathon as well). For course highlights and race icons!, the Goodyear Half Marathon and 10K offered two. 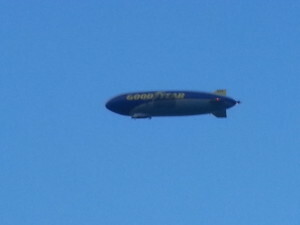 First, the Goodyear blimp circled overhead throughout the race. By my rough count, I spotted it about six or seven times during my run (though, I may have missed count focusing on the miles instead). Having the blimp out in full force for the race was a nice touch; it was cool to be watched over by the same vehicle that circles over countless sporting events (note: this is the only thing I have in common with professional athletes—the Goodyear blimp has flown over me while I competed). The other big race landmark was the Goodyear Proving Grounds and Test Track, a mile plus long loop for cars testing their tires. Again, I liked the idea of incorporating a feature unique to the city into the course, but it wound up being one of the more challenging portions of the course. As a test course for cars, there was not a lot of coverage, trees, buildings, or other sources of shade. Granted, the temperature is outside the control of the race organizers, but the Test Track definitely capped off a challenging, hilly course. The race concluded back on the Goodyear headquarters grounds where we started. The course layout included an additional sensor strip about halfway between the 13 mile mark and the finish line. This allowed the announcers to determine which runners were about to finish, and provide a shout-out as the runner crossed the finish line. Definitely a cool touch! Both the 10K and the Half Marathon have the same finisher’s medal. 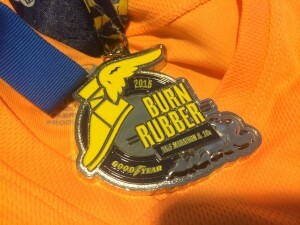 The front of the medal has the Goodyear logo, the race year, and name written in blue and yellow. The back has the logo for the Rubber City Race Series engraved on the back. The medal’s ribbon is also blue and yellow, and includes the race name and the Rubber City Race Series logo on it as well. Runners cruised through the finish line and were treated to the usual suspects of the post-race walk: finisher’s medal, water, Powerade, banana, chocolate milk, and photographs with your new SMO. Every runner (both 10K and half marathoner) had two complimentary food tickets redeemable at food trucks operated by Swenson’s and Eddie’s Cheesesteaks—both Akron mainstays. For good measure, there was also an abundance of Stricklands Frozen Custard, yet another Akron mainstay! Runners old enough to drink were also entitled to one free beer. For entertainment, a cover band was playing rock music in the finish line/food area. I used the same iPod playlist that I’ve used for my two previous half marathons this year, so I did not have many new highlights. As with the Thirsty Dog, one of the biggest sources of on the course support came from local bands and musicians who set up and played impromptu sets throughout the course. And what an eclectic bunch: I saw everything from rock bands to string quartets. Could it be that Akron is as musically inclined as it is a top runner destination? The Goodyear Half Marathon and 10K is a challenging but worthwhile addition to the Rubber City Race Series. In its inaugural year the Goodyear Half Marathon and 10K is a good event in its own right. Its strength, in my opinion, is as the second of the three-leg Rubber City Race Series. As I mentioned, the timing of this race puts it squarely between the Thirsty Dog and the Akron Half and Full Marathon, providing a great accountability run for the September event, and something to work towards following the late-June event. In that vein, the Goodyear Half Marathon and 10K does that perfectly. 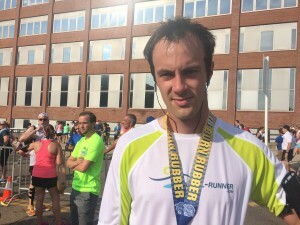 The course challenged me to prep myself for the running of the Akron Half at the end of September, and I am looking forward both to running a third fun Akron race and capping off what has so far been a successful first edition of the Rubber City Race Series. The Casual Runner Team wants to hear from you. If you have any questions about anything we cover here on Casual Runner, if you have any questions regarding running gear or training for your own Casual Running needs, or if there is anything that you would like us to cover on Casual Runner, please leave a comment or email us using the links below. To ensure that you do not miss all of the great content from Casual Runner, please be sure to like us on Facebook, follow us on Twitter and Instagram, subscribe to our YouTube channel, and add us to your circle on Google+. See you out on the running trails! Neither Steve nor Casual Runner received any compensation for this review. The entry for the race reviewed herein was provided by the event organizer for purposes of this review and the opinions are solely those of the author.